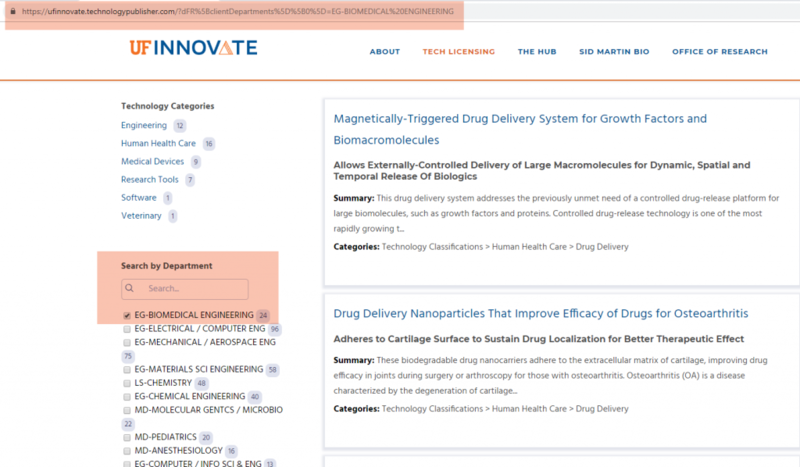 We have more than 500 technologies published on our website. Only some of them are yours. Innovators, wouldn’t it be nice if you could display all your published technologies on your own web page? Or even your biography and your published technologies? Departments, wouldn’t you like to showcase your innovators’ technologies? Have them stay up to date — without any effort from you? See instructions for innovators or department web wizards on one of the tabs below. As always, if you have questions, please call (352) 392-8929 for help. If you are on social media and you add your page to your website, please take a screenshot (and tell everyone how easy it is to do!). Then let us know by tagging @UFOTL on Twitter, Facebook, or LinkedIn. 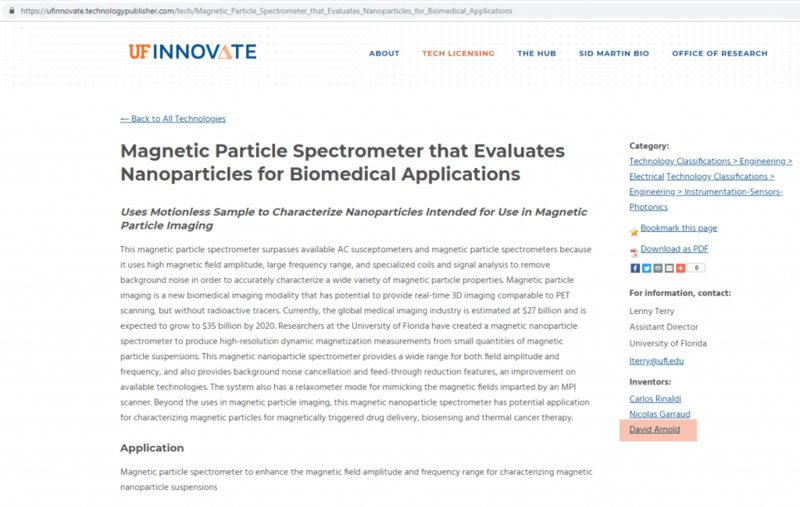 Your first step is to visit our technology publisher: https://ufinnovate.technologypublisher.com/. Innovators, search for your name in the “Search for technologies” bar. Check the results to make sure they are yours. If so, highlight and copy the query URL at the top of the page. Search for your name. Copy the resulting URL. Copy that URL to use if you want to link to your biography page or embed it on another website. 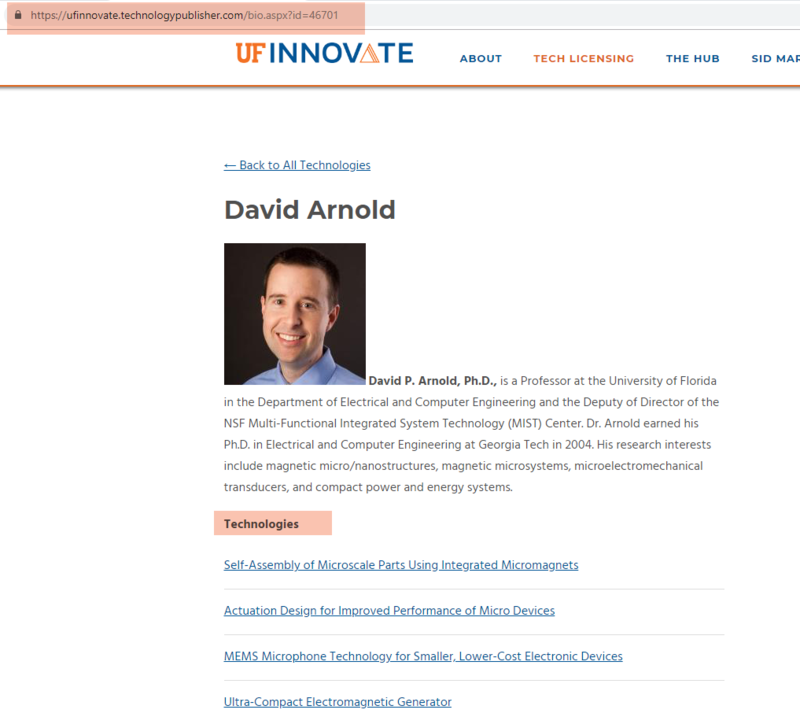 If you want to link to your innovator bio page showing your published technologies or add just your published technologies to your own biography webpage, you’ve got what you need. You can adjust the width and height to your liking. That’s all there is to it. Please let us know if you have any questions. Search for your department. Check the box beside your department. Copy the resulting URL. If you want to link your entire department’s published technologies, you’ve got what you need. That’s all there is to it! Please let us know if you have any questions. You might want to embed the technology page without embedding our header. Sister City Program of Gainesville, Inc.
23apr7:00 pm11:45 pmGainesville Hackerspace: Tuesday Open Housecome out, see the space, and meet some awesome creators -- and do it again next Tuesday! Tuesday nights are open to all. Doors open at 7pm, it's fine to show up later, people will still be around. Feel free to bring a project to work on! Tuesday nights are open to all. Doors open at 7pm, it’s fine to show up later, people will still be around. Feel free to bring a project to work on! Gainesville Hackerspace provides a physical space where hackers, engineers, scientists, artists, and other creative types can gather to share ideas, equipment, opinions, and even food. Members are likely to show up to work on personal projects, consult with other members, and learn new things. More than just a project workspace, we aim to share all types of knowledge in a friendly and collaborative environment. 24apr11:30 am1:00 pmBusiness Valuation: 35 Business Killers (to Avoid)Lead your company on the right path to success! Join Patrick Emmet of Business Valuation, Inc. for this lunch and learn titled “Business Valuation: 35 Business Killers (to Avoid). Patrick will discuss business valuation strategy, explain financial infrastructure, and lay out 35 business killers — all in an effort to help lead your company on the right path to success. Accurate business valuations impact a broad range of areas for companies of all sizes. While some valuations are required for tax and regulatory purposes, others are undertaken to analyze the financial value of specific products, programs or operations in order to develop strategy, minimize risk and maximize strengths. Patrick has spent the past 30 years in leadership roles in finance, sales, operations, and administration. As managing director of BVI, he is responsible for day to day operations and long-term strategic development and implementation. Prior to joining BVI, Patrick was with Encell Technology, a new technology rechargeable battery storage company located in Gainesville. As head of administration, he was responsible for recruiting, human resources, information technology, and was a crucial member of the capital raise team that raised $15M. Before joining Encell, he was Chief Financial Officer of an executive staffing firm, Global Director of Finance and Regional Director of Operations for a worldwide logistics company and started his career at Frito-Lay in the sales organization. 25apr11:45 am1:00 pmIPDC Lunch & Learn Series: Ten Legal Mistakes Entrepreneurs MakeAvoiding pitfalls on the path and legal headaches down the road. Avoiding pitfalls on the path and legal headaches down the road. The SF IPDC Lunch & Learn Series offers local inventors, entrepreneurs and innovators the opportunity to connect with IPDC Partners, organizations and private sector companies who provide mentoring and learning opportunities for start-ups and their founders. These FREE events include networking, lunch and interactive presentations by subject area experts on topics relevant to product commercialization and growing your new business. Seating is limited so reserve yours today! Mark Long, Director of Incubation Services at UF, will moderate the panel. 25apr5:30 pm7:30 pmUF Digital Worlds Institute Convergence 2019 Student ShowcaseCheckout student projects from Digital Worlds! Check out students’ innovative Digital Arts and Sciences projects at Student Showcase. The event will premiere 35 Digital Worlds capstone projects, along with 25 video game projects developed in special collaboration with the UF Computer Science and Engineering Department. The goal of Student Showcase is to highlight up-and-coming talent from Digital Worlds and help prepare students for their future in digital media design and production. Come join us as we celebrate the end of the year by showcasing our students’ work. 25apr6:00 pm8:30 pmTech On Tap GNVGAINESVILLE DEV ACADEMY GRADUATION DEMO DAY! TECH ON TAP GNV WILL BE HOSTING THE GAINESVILLE DEV ACADEMY GRADUATION DEMO DAY!! Join us at the Cypress & Grove Brewing Company at 1001 NW 4th Street from 6:00 PM – 8:30+ PM! Gainesville Dev Academy will provide one (1) free drink ticket per attendee! – 6:00 to 7:00 – Networking. Food and drink available for your own purchase. A food truck will be on-site for you to buy food from too! Got a cool app for Show & Tell at the next meetup? Please reach out to msutherland@waldenrecruiting.com. Join Dan Fuchs of Hutchison Law to learn how to avoid pitfalls on your path to Series-A. In this breakfast seminar, Dan will provide answers to some of the common issues entrepreneurs face when starting a company, such as what type of company you should form, how to document employment relationships as well as relationships between founders, and how to protect IP and attract investors. It is time for the 4th Annual Community Job and Resource Fair, in collaboration with the Re-Entry Partnership Initiative. The Community Job and Resource Fair aims to strengthen families and the community by helping individuals re-enter the workforce, thereby increasing the stability of families and empowering the economy. Each year, employers have taken advantage of this unique opportunity to meet a large group of qualified and talented job seekers in one convenient location. The Community Job and Resource Fair is scheduled for Tuesday, April 30, from 10am – 1pm at the Headquarters Library (401 E. University Ave, Gainesville) in Meeting Room A. If your business is seeking qualified job seekers and looking to hire in the near future, the Community Job and Resource Fair is a great opportunity to meet a large number of energized job seekers in a short amount of time. Please bring specific listings of current job openings, including skills and qualifications for these positions. All participating employers will be provided lunch, a 6-foot table and two chairs. Free Wi-Fi will also be available. We recommend that participating employers arrive to setup at 9am. Employers who have participated in the past have found this useful for securing nearby parking, setting up displays. Primary parking is available in the Headquarters Library lot, while overflow parking is available at the Kirby Smith Building. The fair begins promptly at 10am. The event is free for both employers and job seekers. The registration deadline for employers is Friday, April 25, 2019. Employers can register to participate in the Community Job and Resource Fair by emailing cherie.kelly@pfsf.org the attached employer registration form. Spaces are limited so early registration is encouraged. If you have attended the Community Job and Resource Fair in the past, we look forward to seeing you again! If you plan to participate for the first time this year we are excited that you plan to take advantage of the unique event. 30apr7:00 pm11:45 pmGainesville Hackerspace: Tuesday Open Housecome out, see the space, and meet some awesome creators -- and do it again next Tuesday!